Jim Heaphy/Wikimedia CommonsThe street went up for auction after residents failed to pay $US994 in property taxes. The well-off residents of Presidio Terrace, an exclusive San Francisco neighbourhood filled with mega-mansions, aren’t happy. According to the San Francisco Chronicle, they recently found out their private street was bought by a couple from San Jose, Tina Lam and Michael Cheng, more than two years ago in an auction. The purchase “appears to be the culmination of a comedy of errors involving a $US14-a-year property tax bill that the homeowners association failed to pay for three decades,” according to the Chronicle. The unpaid taxes, penalties, and interest added up to $US994 — a mere fraction of the purchase price for the street, footpaths, and “common ground” that Lam and Cheng now control. 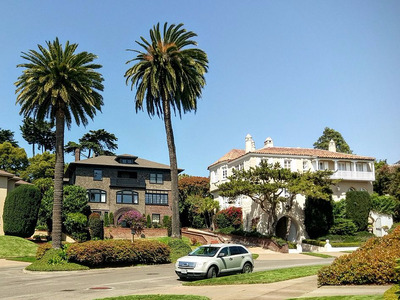 The 35-property community is adjacent to the equally wealthy Presidio Heights, where the median home value sits just above $US5 million, according to Zillow. Presidio Terrace has been managed by its homeowners since 1905 and is guarded by round-the-clock security at its stone-gate entrance. The homeowners claim the annual tax bill was, unbeknownst to them, sent to an unused address since the 1980s. But a spokeswoman from the treasurer-tax collector’s office says it’s the homeowners’ responsibility to keep tabs on their bills. “Ninety-nine per cent of property owners in San Francisco know what they need to do, and they pay their taxes on time — and they keep their mailing address up to date,” Amanda Fried told the Chronicle. In July, the Presidio Terrace Association filed suit against the city, asking for the sale to be reversed and blocking Lam and Cheng from selling the street while the appeal is pending. Since it’s been two years since the sale, Fried said, there’s a slim chance it will get overturned. In the meantime, the couple is considering how they’re going to make money off their land, even posing the idea of charging rent on the private neighbourhood’s 120 parking spots. The couple doesn’t appear to be in any rush to sell, however. “I’m a first-generation immigrant, and the first time I came to San Francisco I fell in love with the city,” said Lam, who was born in Hong Kong, came to the US for college, and now works as an engineer in Silicon Valley. “I really just wanted to own something in San Francisco because of my affinity for the city,” she told the Chronicle.